AddressIt is an app that combines all of your contacts, shares your location, and manages your photos. Have you ever wanted your social-networking contacts, along with your phone contacts, all in one app? AddressIt combines them for you! You can use that information to make a call, send text messages, email, and so on. You can even share that contact information with others. The nice thing is you do not need to save the contacts manually. AddressIt pulls that information for you. One can periodically refresh the cached information. AddressIt provides automatic contact mapping as well as profile browsing capability of your online friends and colleagues. AddressIt provides capability to backup these contacts so that you can access them from iTunes' Device Apps File Sharing section. You can use that backup to import it into other application or other devices. You can import your online contacts into address book, remove duplicate contact entries, combine these duplicate contact entries into one. You can also save your current location for future reference, share it with your family or friends only when you need to. It's just one click away for you to save and share your location. AddressIt even allows you to save your photos to your online feed or your online album, along with the location. 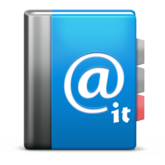 ★ Import all your online contacts into one address book. ★ Access your online contacts without network connectivity. ★ Remove all duplicate contacts (two or more contract entries of the same person). ★ Combine these duplicate contact entries to make one entry with all of the information. ★ Synchronize address book contact photo from their online profile. ★ Organize all your online photo albums in one place. ★ Any photo of your mobile or online album can be shared on all of your social networking profiles. Privacy Statement: Your privacy is very important to us. We DO NOT collect any of your information, including third party authentication information. You own all of your contacts, location details, as well as photos on AddressIt, and you can control how it is shared through the app. For more details, please check out our privacy statement from AddressIt's About screen. We appreciate your feedback or other suggestions about AddressIt and our other Apps. Best Quotes and Photos at your fingertips. Listen to quote. Voice command activated. Send it to Facebook feed, Twitter, or Email/Text. Customize your own message along with your own photo to share. Copyright (c) 2011 IshTec, Inc.